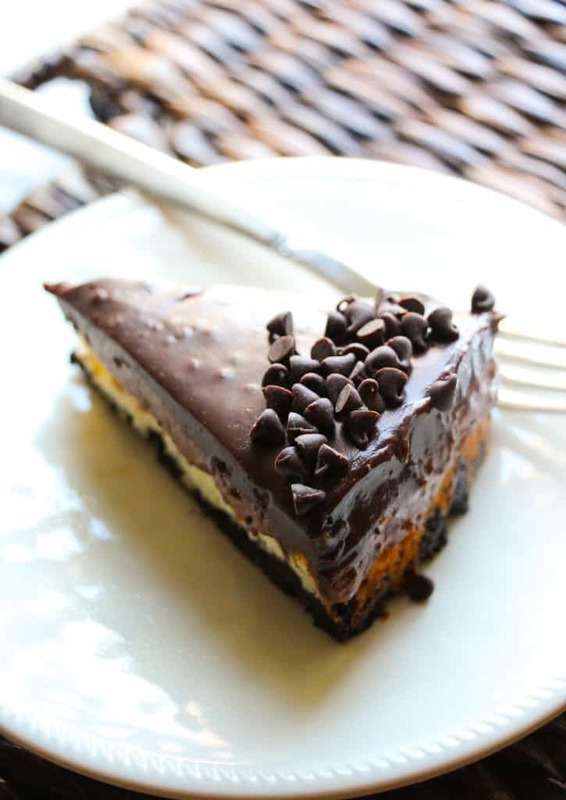 The most amazing cheesecake you will ever taste layered with a luscious chocolate mousse, dreamy chocolate ganache, and a thick oreo crust. 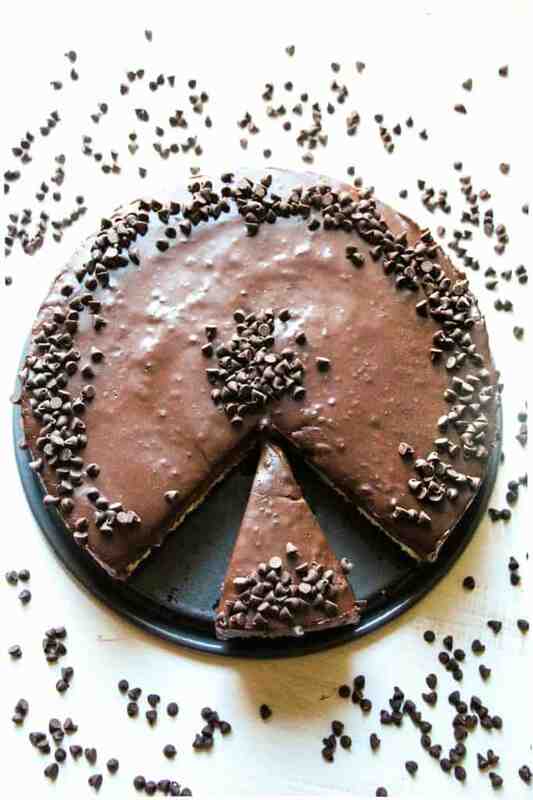 This cheesecake is something every chocolate lover must make at least once in their life. I made this cheesecake last weekend and have been obsessing about it since. After 1 1/2 slices within about 10 minutes I decided I needed to get it out of the house ASAP, so I saved a few pieces for my mom, dad, and brother to taste taste after dinner and packaged to rest up to take to our neighbors. I’m glad I did because this stuff is dangerous. And I totally would have convinced myself that it would be okay/acceptable to have a piece for breakfast the following morning. Breakfast of champions right there. That being said, this stuff is the bomb-diggity. Do people still use that terminology? This cake is the farthest thing from diet food but who the heck cares. It’s dessert. And it’s one of the best desserts I’ve ever made. Why? You get two in one. 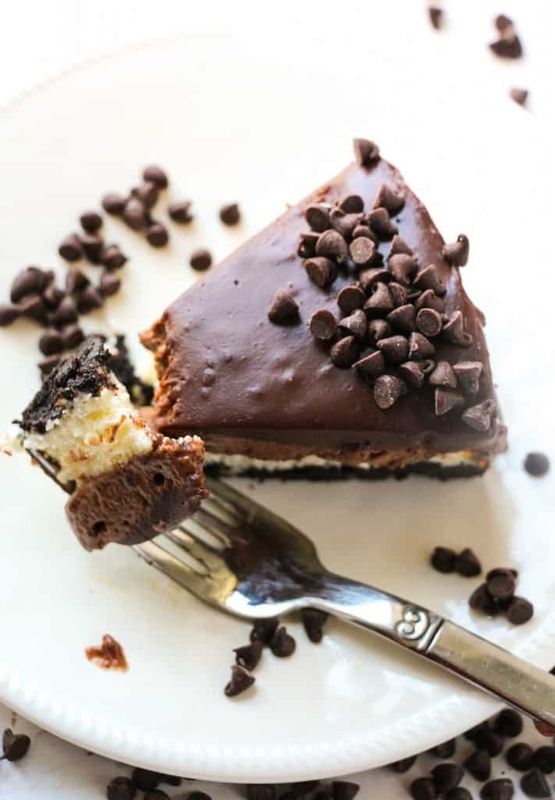 The creamiest cheesecake and a healthy dosage of chocolate. Yes, chocolate definitely has its own dessert category. Because the only thing better than dessert is a double dessert. First, let’s talk about the cheesecake. Five words: my all-time favorite cheesecake recipe. I can’t even describe it. Soooo creamy, dreamy, thick, moist, and glorious. 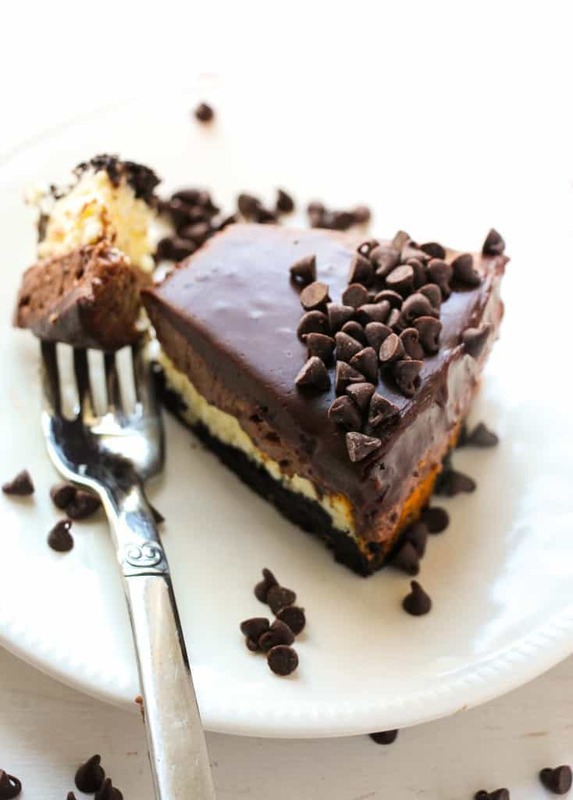 But when you put all the layers together: the silky, slighty crunchy oreo crust, the dreamy cheesecake, the thick chocolate mousse, and the rich chocolate ganache… it turns into something even more extra ordinary. It was decadent. Smooth. Silky with a slight crunch from the crust. Delectable. Rich. PERFECTION. Every layer complimented each other brilliantly. I was shocked. I couldn’t believe I had made this cake…every single layer. This cake is such a fun alternative to traditional cheesecake. And it’s quite the show-stopper! Everyone gathered around the table will be impressed. I highly recommend you bake this tempting cake for company and not just for… yourself because as soon as this masterpiece is complete, self control will no longer be your strong suit. 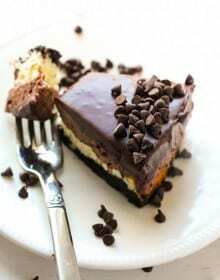 **To make things easier, make the cheesecake and crust on one day and the mousse and ganache on the next day. Cheesecake lasts longer than mousse. Keep this cake refrigerated and will last up to 2-3 days but is best eaten the day it’s made. Or if you are pushed for time, you could also skip the mousse layer and just do the chocolate ganache. Adjust oven rack to the lower third position and preheat the oven to 350F degrees. Spray a 9-inch springform pan with nonstick cooking spray. Crush cookies in a food processor or in a ziploc bag. IIn a bowl or food processor, pour melted butter on top of the crushed cookie and pulse or mix well.Place the oreo mixture at the bottom of a springform pan. Smooth out the mixture with the bottom of a measuring cup or glass. Wrap the bottom of the pan in a double layer of aluminum foil. Set aside. Place the springform pan into a large roasting pan and place into the oven. Fill with about 1 inch of hot water. The foil wrapped around the pan will prevent water from leaking inside. Bake for 65-75 minutes or until the center is almost set. If you find the edges are browning, loosely place aluminum foil on top of the cake as it bakes. Once done, turn the oven off and open the door slightly. Let the cheesecake sit in the oven for 1 hour. Remove from the oven and allow to cool completely at room temperature. Refrigerate for at least 6 hours or overnight (preferred). In a small bowl, melt the chocolate and butter together in the microwave, whisking every 30 seconds. Let cool. Stir in the egg yolks very slowly and carefully. In another bowl, beat the egg whites until foamy. Add the cream of tartar, and continue to beat. Gradually whisk in 1/4 cup sugar, and continue beating until stiff peaks form. In another bowl, beat heavy cream with the whisk attachment until it begins to foam and thicken up. Add the remaining 2 tablespoons sugar and vanilla. Continue to whip the cream until it holds soft peaks. Heat the cream in a small sauce pan over medium heat. Heat it up just BEFORE it boils. Place the chocolate in the cream, and remove from heat. Stir the mixture until smooth. Pour over the chocolate mousse, return to refrigerator and chill for at least 2 hours before serving. Enjoy! Use GF chocolate sandwich cookies from Trader Joe’s to make this gluten free.